Best for: Those who are grieving, or those who want to be better prepared to support those who are grieving. In a nutshell: People who are grieving deserve better than what society offers them. This book attempts to provide some direction towards that. Line that sticks with me: “We have to be able to see what’s true without fear of being seen as weak, damaged, or somehow failing the cultural storyline.” (p 54). Why I chose it: Ms. Devine spoke at an event I attended this past weekend, and was kind enough to also sell her book to attendees prior to it’s release next month. The book is written almost as a love letter to a friend. Ms. Devine carries such kindness in her writing, stemming from her own experience witnessing the sudden death of her partner Matt. 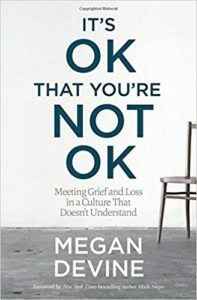 She was a writer, therapist, and artist prior to his death, and was able to take her experience, along with what she has learned from others, to create a community (Refuge in Grief) to help others experiencing grief, and write a book that both validates feelings and provides practical tips for navigating an experience that is utterly horrible. The through-line of the book is that grief is not a problem to be fixed. It is a new reality that the grieving person must honor and tend. People will not “get over” profound losses, and it is cruel to demand that they do. Friends and family members of those who are grieving want their old loved one back, and don’t listen or pick up on the overt and subtle clues that they are not helping. We want to help, but we want that help to lead to things being fixed, and that’s not a thing that will happen. In my work, we have that list of things to never say to someone who has lost someone, and I see some of those phrases included here as well. Things like “they’re in a better place” or, worse, “everything happens for a reason.” Ms. Devine goes into why these phrases are so very hurtful, regardless of the fact that they usually come from a good intent. Like in so many areas of life, the harm caused doesn’t care what the intent was. There are a million things I could say about this book. I should caveat my review by pointing out that I am not the primary target audience — I have so far been lucky enough to not have experienced real loss in my life — but I have seen enough friends living in their grief to want to know how I can better support them. While there is a section of the book that is directed at folks like me that I found immensely helpful, there is also such value in reading words directed at those who are experiencing loss. I cannot understand what they are feeling, but I can at least get a sense of the challenges they are facing and the ways our culture and society can make a horrible experience so much worse. The event I attended where I purchased this book was Death Salon Seattle. I chose to attend in part because I think our society has a very strange and unhealthy relationship with death in myriad ways [from how some refuse to talk about it, to how others are forced to talk about it at way too young an age, to how we expect those who lose someone to ‘get over it’ ever (and usually in a few months, maybe a year tops)] and partly because my job, as some of you know, involves planning for the response to a mass fatality incident. Most days I’m doing something death-related; the Salon gave me an opportunity to look at death outside of the plans and procedures and meetings that fill up my workday. Seeing Ms. Devine speak is a gift. She was able to tailor her talk to this group in a way that recognized that a bunch of individuals who spend a lot of time thinking and talking about death may have some very specific ways we can support those who are actually experiencing loss. This book is another gift, and one I strongly recommend anyone who is thinking this might possibly be something they need pick up. Share the post "Not A Thing To Be Fixed"
This sounds amazing. I’m so glad people are starting to talk about death, dying, and grief in a different way. What an amazing resource. I’m many years out from my own big loss but I find myself now having an incredibly difficult time attending funerals without getting a little panicky. I think I’ll probably read this anyway, but does it talk around that sort of thing? It does not, but I bet that the community on her site Refuge in Grief has something on that. the wider RIG community totally talks about that stuff: the long range effects of grief on so many aspects of life. Grief isn’t a one time event and you’re done. Come on over – we’d love to have you. As a person who has been through loss at every level I am always looking for resources to read and pass along to those I minister to. Our culture isn’t comfortable with grief. You never get over the loss. It may lessen but can be triggered and feel like the day life came to a halt. Grief is the last act of love.